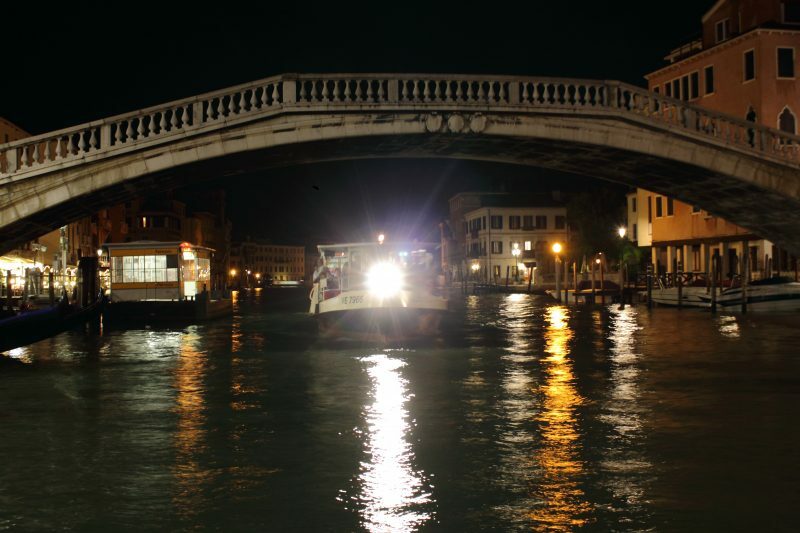 Night photo of the Night Water Bus passing under the bridge near the train station on the Grand Canal in Venice Italy. Spotlight illuminating the water as it approaches the dock. Venice tends to go to sleep relatively early, and if you are used to cities like Rome you may be caught off guard. We found ourselves looking for things to do late in the night in Venice. The night bus offers relaxing entertainment for an hour or two. During the day the water buses are loud and cramped but the night water bus can actually be romantic. Get on at Ferrovia station (the train station stop) and ride it away from all the bushiness(west). If it looks like the photo above you are will get on the right one. Everyone on the water bus should get off at the train station and the front or back seats will be all yours. Now enjoy your private boat ride for the next hour and half. If you get on going the other way Rick Steves audio guide (The Grand Canal Cruise ) would also work fairly well on the night route. The Vaporetto Route N (night bus) Venice water bus route N operates in both directions.